Packaging specialist Blue Marlin has created new branding for Britvic’s three-strong Idris range and R White’s Cloudy Lemonade. The Idris revamp is part of the drinks company’s aim to update its soft drinks’ images. ‘The final result for Idris is a strong, coherent range of highly impactful, fully shrink sleeved carbonates which will turn the Traditionals sector on its head,’ says client services director Philip Langford. 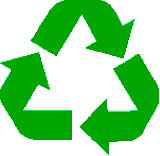 What are the origins of the recycle marque?